(CNN) - The Navy has expanded its hair rules for female sailors, now permitting braids, ponytails and lock hairstyles. Women in the Navy will also be allowed to wear wider hair buns under the new rules that came into effect Wednesday. Will China have aircraft carrier that can match US Navy's? The announcement was made during a Facebook Live held Tuesday with the Chief of Naval Operations Adm. John Richardson and Chief of Naval Personnel Adm. Robert Burke. Richardson said that the move was to make the US Navy "much more inclusive." 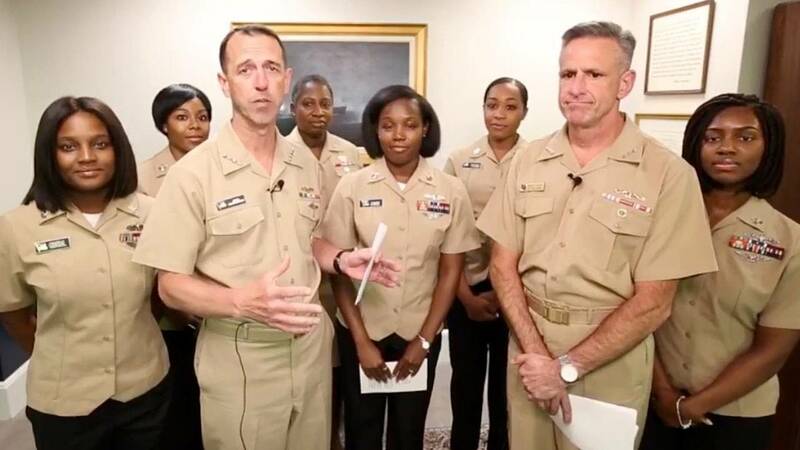 The announcement was made with six African-American female sailors, who comprised a working group that made the recommendations. The new hairstyles are approved as long as female sailors can properly wear safety equipment, keep their uniform head gear squarely on the head and no safety hazards are presented, according to the Navy. Ponytails, single braids and French braids will be allowed when wearing service, working and physical training uniforms. Hair buns can now be the width of the back of the head. Lock hairstyles may be worn in short, medium and long hair lengths. The partings must be square or rectangular "in order to maintain a neat and professional appearance." Female sailors can wear their hair down, below the lower edge of the collar of their blouse, jacket, or coat when they're in dinner dress uniforms. The Navy last expanded its hair policy in 2014 to permit more styles for women of color. It had also then issued a photo guidance of what kind of hairstyles were allowed for women with short and long hair, including bobs, pixie cuts, cornrows and multiple braids.